This past fall, I participated in Crescent School’s Grade 11 Leadership course and I had the chance to work with University of Toronto’s Innovation Hub. The course tasked students with applying design thinking processes to solve a problem for a community partner. Of all the potential community partners, the Innovation Hub spoke to me the most, as I am a strong advocate in improving the lives of students. Luckily, I was gifted my first choice, along with three other students. My first interaction with the Innovation Hub was through Nick, a Senior Research Assistant. He presented our group with a challenge: to improve Convocation Hall. Our group set out to visit Convocation Hall, record some initial observations, and identify what problems needed to be addressed. I first noticed that the space was massive, seating up to 1,730 people. It felt foreign, in contrast to my average classes of around 20 people. From there, issues with the space arose. The seats were small and uncomfortable. Because of a lack of writing surfaces, it was difficult to take notes. Light was too faint to take physical notes without straining one’s eyes. 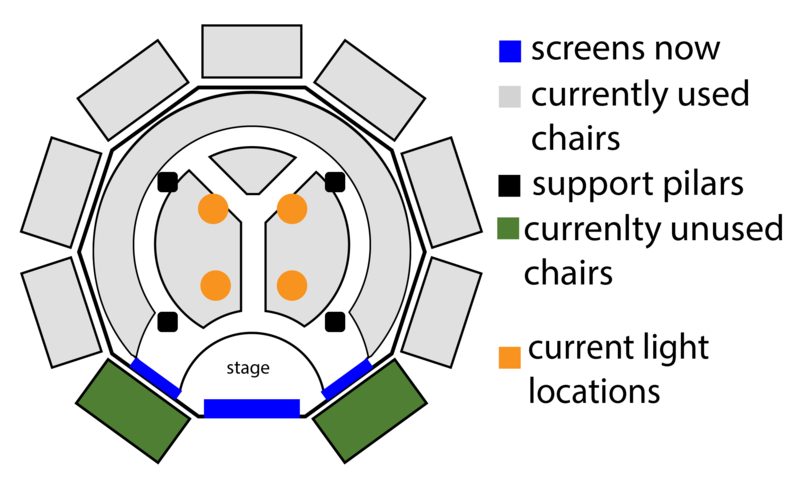 The angle of the seats in the balcony, and the pillars, made it hard to see any of the screens. Lastly, the venue’s poor acoustics caused any question to drown in echo, making it nearly impossible to hear. Once I collected the preliminary information about Convocation Hall, my group and I set out on gathering data via empathy-driven interviews. The first interview was with a PhD student (and teaching assistant) at York University. She said that throughout her career in education, she has identified three main pillars that are vital for a student’s learning: their environment, their comfort level, and their engagement. The first has to do with the temperature/lighting, the second with the students’ comfort and ability to take notes, and the third is directly related to what they are given before the class, the content, and the way it is presented in the class. For example, if a student is given the slideshow prior to class, they might not attend lectures if no new or relevant information is supplemented by the professor. The second interview was with a younger teacher at our school. He told us that his experience in university—despite going to a relatively small school—was overwhelming and very different from high school. He pointed out that one of the most useful classes required him to give speeches and presentations at a podium in front of his classmates, developing his public speaking skills. He also suggested that groupable desks, for cooperative work and discussion, might help raise students’ engagement. These ideas led to us to refine our problem using the following “How Might We” statement: How might we help students with their studies by keeping them interested, comfortable, and attending class? This statement allowed us to narrow our goal and generate ideas and storyboards. We proposed five ideas to Nick to solve the problem. The first involved the addition of desks and power plugs. 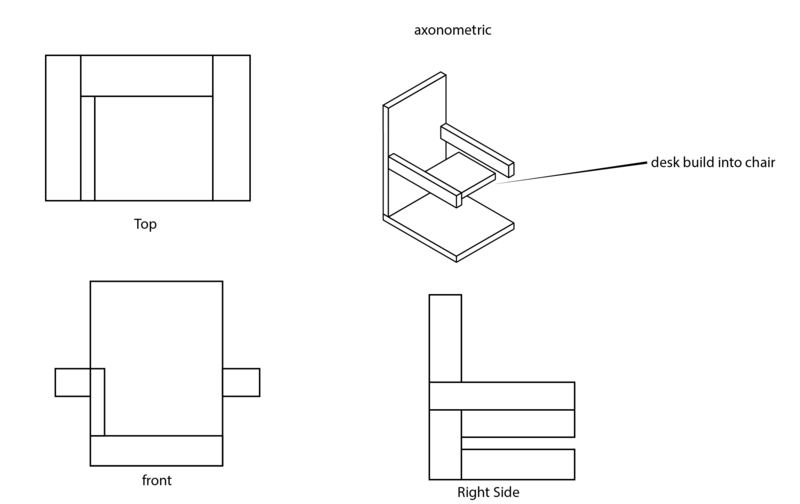 Desks would either be integrated into each chair or stretch across each row, with pull-out chairs attached. The second called for atmospheric improvements: lights, audio, pillars, acoustics, and front-row angle. We thought that the number of lights should be increased with diffusion filters to ease the strain of looking and trying to take notes on paper. 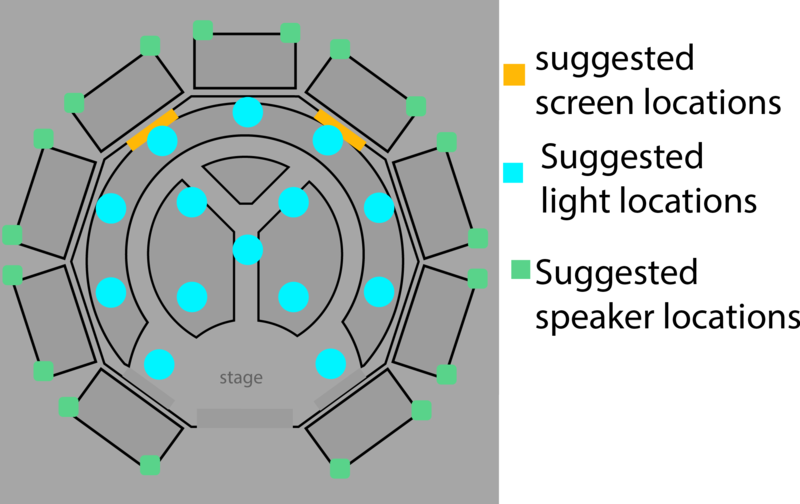 The speakers need to be improved, and the ones that do not function very well should be replaced. The acoustics should be improved, as all sound not though a speaker is muddled and incomprehensible. Finally, students in the front row need to look up to see the PowerPoint slides and causes strain; therefore, the projector should be lowered. The third idea suggested group-able desks, allowing for discussions between the students. This could improve engagement in the class, as not everything in the lecture is on the slides. The fourth idea consisted of an anonymous question board, which would allow questions to be asked more efficiently. At times, students may want clarification, but are uncomfortable asking the question in front of everyone. The fifth idea was to improve screen visibility. 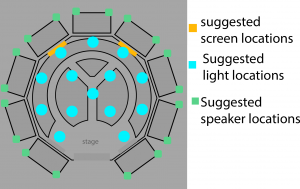 More screens showing the PowerPoint would be useful, as the people in the O and P balconies cannot easily see either board; the main screen is askew and the secondary display, meant for balcony viewing, is slightly blocked by one of the pillars. These five ideas were submitted to Nick, and two were chosen to be made into prototypes: the atmospheric changes and the addition of desks. 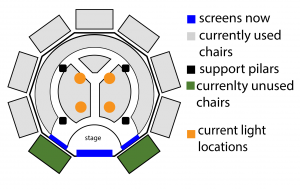 Due to the restriction on time and resources, we resorted to creating digital prototypes of chairs and how the layout of Convocation Hall could be changed. However, an issue arose as we were planning the prototype test. In order to test our chairs, we needed to a physical prototype. 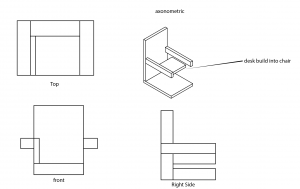 To get around this issue, we used the only classroom in our school that had chairs with pull-out desks, which served as a representation of the prototype. The test involved half of the class use chairs without desks, while the other used the aforementioned chairs with pull-out desks. The test showed that the half without desks took fewer notes. They said they would rather not take notes so as to not have to deal with the discomfort. This further proved that our prototype chair is preferred over regular chairs. With this information, we amalgamated it into our final presentation. Thanks to the way that our design system was structured and the feedback we gained from the Innovation Hub, we ended with a prototype product of our idea that we were happy to share with our class and the Innovation Hub. And now, looking back on it all, the only thing I wish I could still do is continue working with the Innovation Hub to bring the solution we had for Convocation Hall to fruition. Previous PostPrevious Exciting opportunity to learn Design Thinking and be involved with the Innovation Hub! Next PostNext What Makes a Classroom Great? Join us and share your thoughts!